There are many region and area spread across the country ideal for deluxe camping camping. Each place brims with its forte in term of scenic grandeur, serenity, birding, weather etc. Many trails and smaller roads to reach villages have given way to feeder roads and in some case paved one too, an infrastructural initiative by government to connect villages with mainstream towns and cities. But in no way has it affected or undermine the charms of the hike or bike through these scenic countryside. Camping near these villages also allows more opportunities to interact with villagers and sneak peak into the way of their life. 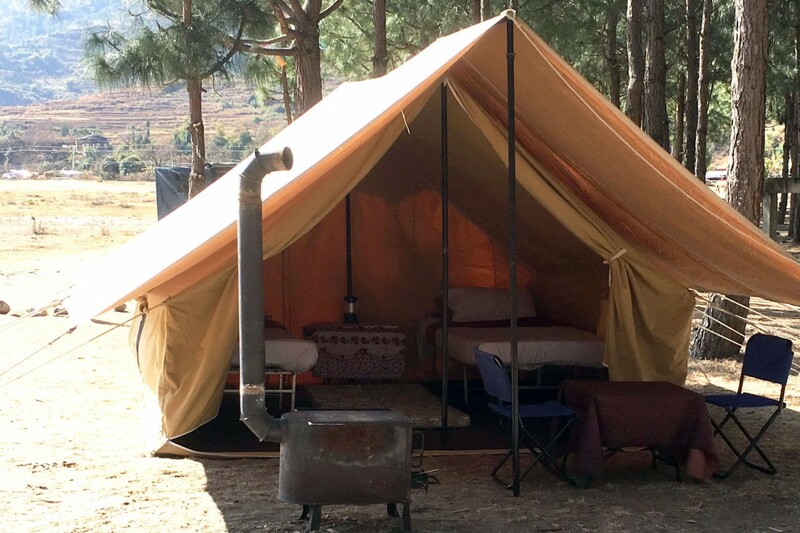 Upper Punakha: Camping along the sandy beach on the bank of Mochu river in the upper Punakha valley at around 1500m above sea level is a romantic reality. The surrounding dense jungles boast rich bird and wildlife. Along the way, you will pass through idyllic countryside villages. Camping hear isidle from Nov through March. Gasa Hot Spring: Gasa area is known for its beauty and its old fashioned charm but also for its hot spring, which is considered to have a therapeutic benefits. From Punakha it takes around 4hrs on vehicle to reach. The highlights is the Gasa Dzong (2800m) and the hot spring located near the river at 2100m. The village of Gasa is surreal image of old western town with visitors from remote village of Laya wandering about and their horses tied to shops. Gasa is the district center for remote villages of Laya and Lunana. Gogona Village: A cluster of 7 or 8 houses and a monastery forms the village of Gogona (3080m). A short distance beyond are more houses and sheep farm with cheese factory. It was part of famous 3 day cultural trekking route called Gangtey Gogona trek starting in Gangtey, Phobjikha and ending in Chuzomsa near Wangdue Phodrang. With the arrival of road it takes around 2hrs by 4wd drive and around 3-4hrs bike mountain bike ride from Gangtey. As the place is relatively high and cold in the winter, camping here is best from March till May and in Oct & Nov.
Khotokha: is a relatively large flatland in mountainous Bhutan and therefore once proposed for an airport. It has many 4-5 house villages scattered around the valley with some temples, monasteries and few saw mills because of huge supply of pine trees. The valley is temperate located at about 2600m and temperature is similar to that of Paro and Thimphu, located around the similar altitude. Camping can be done here from March till Nov (avoiding the rainy season). It is around 6hr walk and 2hrs drive from Gogona (probably around 3-4hrs to bike). From Khotokha, Wangdue Phodrang Dzong is around 2hrs along the dirt road. Central & mid- south region are considered birding paradise, as these region have condusive climatic conditions for birds and other wildlife to thrive. The temperate broad leave forest touches the sub-tropical jungles of the lowland of Manas. It also means that it can be considerably hot in summer and wet in the monsoon. In view of this, the best time to visit and camp is during late fall, through-out the winter until early spring. Nabji and Korphu are two large villages in the remote part of central Bhutan, south of Trongsa. These two villages are about 2-3 hrs by walk apart, located on the opposite ridges. The villages are home to Monpa people, a semi nomadic tribe, believed to be one of the original inhabitants of Bhutan. Camping here offers good opportunity to explore the villages, its temples and meet the locals who are so eagar to talk to you. From Trongsa it takes around 2hrs till Riotala bridge (around 800m above sea level). From there dirt tractor road goes to Nimshong village (around 60 households at 1320m). From Nimshong it is 13kms along the walking trail or use a combination of walk and drive through lush broad-leaf forest alive with abundant bird and mammal life. A good chance here to sight Golden Languars and the rare Rufous-necked Hornbill. The trail undulates through a dense forest to the village of Nabji (1300m), which consists of 44 households with approximately 400 people, situated on a foothill above terraced rice fields. The temple of Nabji, which means ‘promising’ or ‘oath’, harbors the stone pillar to mark the peace between Bumthang & Assam Kings. Camping here can be done from October till March but best in Nov, Feb and March. Tingtibi: Its a small deluxe-tent-bhutan township in mid -south. The area surrounding the town have large vegetations, which is home to many birds and wildlife. 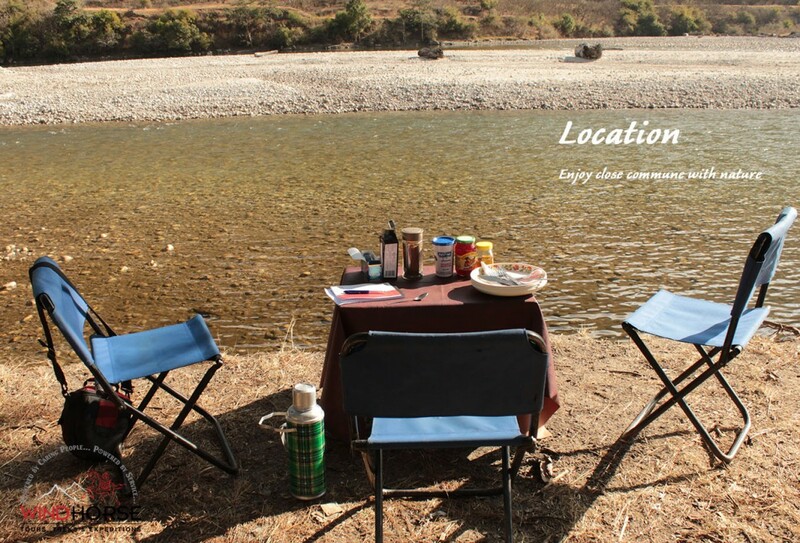 Ideal camping grounds are near the river bed, along Mangdechu river. It is warm and pleasant in the winter months from late Nov till mid march. Manas & Panbang: These small township lies on the nearby confluence of river Mandachhu and Kuri Chhu. The hallmark of this area is wildlife, birding and river rafting. Camping are done mainly within the vicinity of Eco – Camp area. It is within the Manas National Park. Camp from Oct till March. Gongphu: This small village is a focal point for the birding enthusiast as it is consider as one of best birding spot. It takes approx 4-5 hours on vehicle from Manas to the south and 4-5hrs by vehicle from Trongsa to the North to reach the village. Ideal camp site is nearby the National Park office. Camping here can be done from Oct till April but Dec till Feb may be bit chilly. Autsho (Lhuntse) is located near Lhuntshi, in the lowland gorge of Kuri chhu river at an altitude of 850m above sea level has sweltering summers but cool and pleasant winters. The little town of Autsho is option if you wish to visit Lhuntshi Dzong, Khomar village well known for mastery of Kushethara weaving, Takela, where you can see the largest Guru Rinpoche Statue in Bhutan and perhaps in the world, and many remote villages. Although the trip to Lhuntshi can be done as a day excursion from Mongar hotel, it is not possible to visit all of these places and visit them with ease. With no good hotels in the area, Autsho is an ideal camping place. Between Trashigang and Samdrup Jogkhar: Deluxe camping mid way to break free from monotony of long drive especially between Samdrup Jongkhar and Trashigang will serve well, and it will also allow you to visit many villages such as Deothang, Pemagatsel, Orong, Wamrong, Khaling, Kanglung and many other small villages, take time to see the waterfalls, schools etc along the way. There are many ideal campsite, near the villages and depending on the season we can choose to camp high or low. Summing up, in the pristine ambience with awe inspiring landscape and secured with the idea of fresh delicious meals, spacious tent, comfortable bed, cozy campfire, under the starry Himalayan sky and other creature comfort of Deluxe camping can only take your whole outdoor adventure experience to a new height. Soak up in the comfort of deluxe camping and be pampered!!! More than deserving it, you earn every bit of it after a hard day tour. Enjoy Close Commune with Nature by setting up camp in Great Outdoors.